Due to the incomplete state of the extensive renovations undertaken at the Marriott Denver Tech Center, a number of loudspeaker manufacturers were disadvantaged by rooms that were less than ideal—that is, too small—to demonstrate their product as effectively as possible. (It so happened that Magico occupied its customary and spacious 11th floor digs at the nearby Hyatt and risked no such angst, achieving its perennially powerful musical results with M3s.) Still, at the Marriott, I heard many speakers sounding quite good, both old friends and fresh arrivals. As I was responsible for ringing in on loudspeakers in all price categories, it’s the latter group I’ll report on here: All the loudspeakers described below are new products, or at the very least, new to North America. 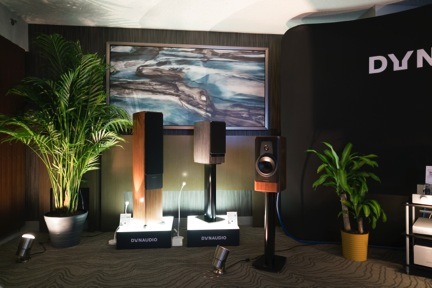 A much-anticipated event was the formal launch of the Wilson Audio Specialties Yvette, another recent design effort led by WAS scion Daryl Wilson, son of the legendary founder Dave Wilson. Peter McGrath, Wilson’s Director of Sales, explained that the $25,500-per-pair loudspeaker should not be viewed as a “replacement” for the recently discontinued Sophia but as a substantially more ambitious design that employs drivers and cabinet materials seen further up in the current Wilson line—”the most advanced and musically refined single-enclosure loudspeaker” in the manufacturer’s history. McGrath demonstrated the speaker quite effectively without any low-end enhancement: A Bach organ recording and electronic pop both did just fine without a subwoofer. Luke Manley’s VTL electronics, a dCS digital front end, and Nordost cables preceded the Yvettes in a chain that was dynamically authoritative, timbrally correct, and emotionally communicative. 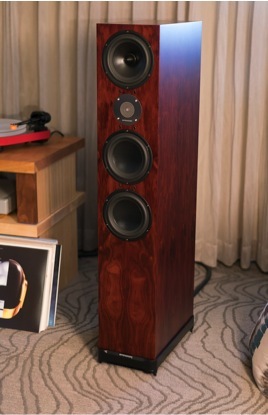 Spendor has a new three-way floorstander, the D9, priced at $9950. Driven by an Ayre Acoustics AX-5 Twenty integrated amplifier, the D9s were tonally consistent from top to bottom, with well-defined bass. This was one of the few rooms that was able to play DSF and FLAC files from the thumb drive I’d brought along. The D9s did quite well with the Shostakovich Symphony No. 15’s opening movement (Haitink/Concertgebouw), a Thomas Campion choral selection performed by Stile Antico, and Lyle Lovett (“I’ve Been to Memphis”). Listening to these very familiar tracks, even after a brief audition I felt I could conclude that these new Spendors are champs in the imaging/soundstaging department and in their ability to render the timbral uniqueness of specific voices and instruments. Dynaudio has redesigned its Contour line, with four new models. The Contour 20 ($5000) that was demo’d at RMAF 2016 is a two-way stand-mounted monitor with an aluminum baffle that reduces diffraction to clarify high-frequency reproduction—as do the curved edges of the cabinet, something new for Dynaudio. The drivers include an Esotar tweeter and a newly designed 18cm woofer with an aluminum voice coil and vented dual-ferrite magnet system. This modest-sized speaker produced potent bass and—as expected from a small monitor, especially one from this manufacturer—there was loads of musical detail and natural spatiality. Purchasers can choose from six standard finishes. 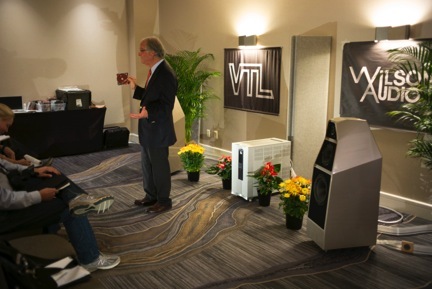 Legacy Audio had five systems set up in a large ballroom, demonstrating seven loudspeaker models including one new one, the Calibre ($5500). Resident in a relatively small enclosure (16.25” x 10” x 15.25”) are five drivers—a 4” AMT ribbon tweeter, a 7.5” titanium midrange, an 8” woofer mounted on top, and two 8” mass-loaded pneumatic passive radiators that face sideways. These speakers were unfazed by dynamic source material, and bass on rock/pop recordings was full and punchy. Legacy Designer Bill Dudleston played “The Infernal Machine” from Fink Meets the Royal Concertgebouw Orchestra, and the coherency of these small boxes was quite impressive. Legacy had the Calibres on prototype stands that will go for around $800 per pair. The British manufacturer Wilson Benesch is making a renewed effort to raise its profile on this side of the Atlantic and its U.S. distributor, Aaudio Imports of Parker, Colorado, presented the A.C.T. One Evolution P1 Ettore loudspeakers ($40,300). Driven by an Ypsilon Phaethon integrated amplifier, orchestral music, jazz piano, and Dire Straits fairly leapt from the speakers with correct scaling and tonal accuracy, without smearing—most surely a result of the “Advanced Composite Technology” employed for WB’s monocoque enclosure which, as usual, incorporates a carbon-fiber-based material. 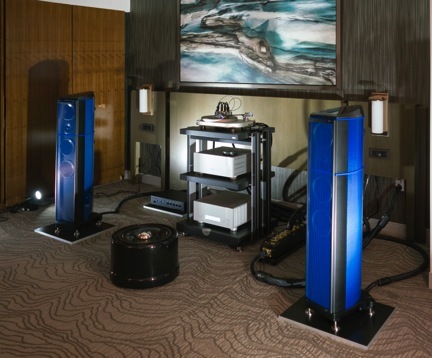 Wilson Benesch has partnered with Hypetex, the inventor of the world’s first colored carbon fiber, and the pair of loudspeakers at RMAF were a stunning blue hue, specifically that of French racing cars—hence the name “Ettore”—as in Ettore Bugatti. Just as visually ravishing as the Wilson Benesch speaker was the Pari Passu ($50,000), a company that doesn’t even have a distributor outside of Japan—though it should. Urushi is a style of painting with colored lacquers; the Pari Passu’s cabinet is fabricated from MDF sourced from Japanese beech and held together with a Urushi adhesive. The enclosure is then finished with a 20-layer Urushi lacquer that requires three months to apply. When I finally stopped staring at the alluring external surface of the loudspeaker and started listening, I heard a highly resolving transducer that idiomatically reproduced vocal and instrumental signatures. The Pari Passu (Latin for “on equal footing”) is a three-way system with crossover points of around 700 and 3000Hz, and a sensitivity of 87dB. Transients—say, the glockenspiel notes at the very beginning of the Shostakovich symphony—were fast and focused; there was solid bass and kick-drum with well-recorded rock. The MartinLogan ESL 11A ($9995) is a new electrostatic/dynamic hybrid from the company that has long managed this combination of loudspeaker technologies better than anyone else. MartinLogan is owned by the same financial firm that owns Anthem electronics and the ESL 11A can utilize the latter brand’s highly regarded DSP room correction software, operating up to around 300Hz, to smooth out some of the inevitable anomalies that occur in most domestic listening environments. Daniel Lowry is a young man with a Biotech day job—and a passion for good sound and fine woodworking. 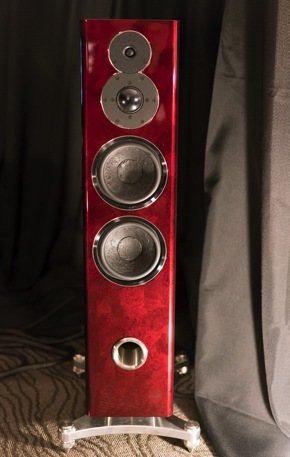 Lowry, who lives in the Denver area, had an extensive selection of his beautifully crafted Law HiFi speakers on silent display in a crowded first-floor ballroom, but his diminutive Sentinel Tower ($800)—clearly intended for desktop use—could be heard in one of the designated “entry-level” rooms on the second floor of the Marriott. Early Sunday morning before the crowds descended, I convinced Lowry to bring a pair of his larger Titan 4th Generation speakers ($3900) upstairs where, powered by an elderly Kenwood receiver, they performed extremely well with both symphonic Power Music and dynamic pop/rock. 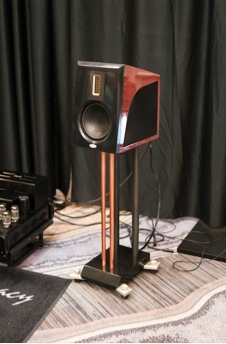 The Audioengine HD3 had been previously shown as a prototype but was officially introduced at RMAF, with a price of $399/pair. This powered desktop speaker, which employs Class A/B amplification, uses the popular A2+ model as its point of departure but incorporates a number of upgraded features including micro-USB input (rather than Type B), Bluetooth aptX audio, a high-level headphone amp, a bass reduction switch (for when a subwoofer is utilized), a front panel volume control, and magnetic grilles. The HD3s are very smart-looking little speakers, with several options of solid wood veneers. Sonically, they were detailed and tonally consistent across their usable frequency range. 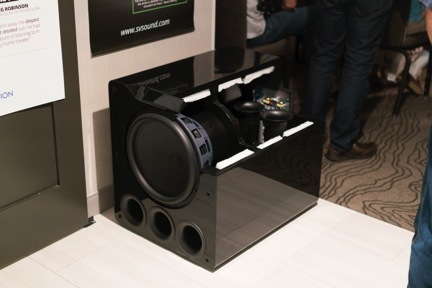 SVS introduced two attractively priced subwoofers at the show from its 16-Ultra Series, the SB16-Ultra for $2000 and the PB16-Ultra for $2400—sealed box and ported box designs, respectively. Both have a 1500-watt Class D Sledge amplifier onboard that can be operated with a DSP smartphone app. To control the 16" driver, a light but stiff cone made of a fiberglass resin composite, SVS employs massive 8" voice coils; the drivers weigh in at around 60 pounds and the diaphragms are capable of impressive excursions. The PB16 Ultra enclosure is larger, sporting three forward-facing 3.5” diameter ports. In a room with a multichannel loudspeaker setup, the deep bass was very well integrated. Something new at RMAF 2016 was “Party in the Pod”, six 90-minute communal listening sessions presented by Classic Album Sundays. CAS is a concept developed by the London-based “audio diva” Colleen “Cosmo” Murphy in 2010. Murphy brought together small groups of people to listen deeply to important recordings, and would provide artistic and societal context and present the music in good sound. CAS gatherings have been held across the U.S. in several European cities, and via Internet radio. In Denver, albums by Stevie Wonder, Talking Heads, Joni Mitchell, Radiohead, Billie Holiday, and Spirit of Eden were presented over the course of the show’s three days. I attended the Talking Heads session that explored Remain In Light, hosted by the well-prepared and well-spoken Sam Willet, who may not have been alive when this classic record was released in 1980. The LP was played on a VPI Classic Signature turntable ($6000) with an Audio Technica ART 1000 cartridge ($5000), through Channel D’s Seta L phonostage ($4998) and Pure Vinyl software ($299) installed on a Mac Mini computer. A Lynx Hilo A/D and D/A converter ($2795) was utilized, along with Jeff Rowland’s Continuum integrated amplifier ($9500) and upper-echelon Cardas cabling. The loudspeakers were Joseph Audio Pearl3 Reference ($31,500). Although we were in an enclosed tent, the sound was excellent (I wouldn’t have minded a subwoofer, though) and the discussion throughout the hour-and-a-half session was interesting and informative. Disappointing to me was that there were under a dozen people in attendance; the space accommodated 40. This was, to me, audiophilia at its best—critical listening with the best gear that permits the recording arts to effectively deliver an artist’s message. I hope CAS gets another chance at RMAF 2017, and at other shows. 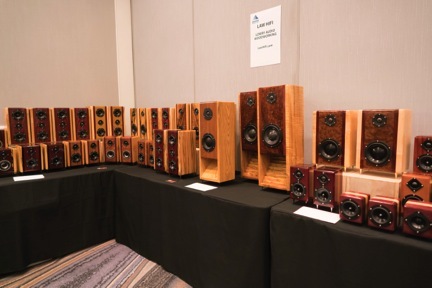 The most appealingly musical sound I heard at RMAF this year was in the very first room I set foot in on Thursday afternoon. I confirmed that impression with a return visit on Sunday. In Room 1030, LPs were played on a Kronos Pro ($38,000) fitted with a Black Beauty tonearm ($8500) and an EMT S75 cartridge (approximately $3900). Digital files and CDs were handled by a Nagra Seven digital recorder ($4800), Nagra Classic DAC converter ($14,000), and a CDT disc transport ($16,000). 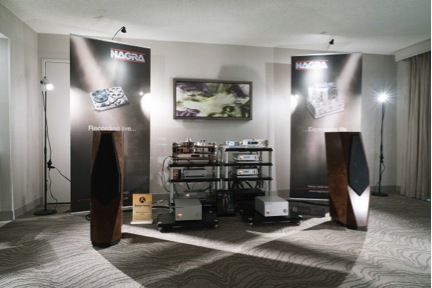 The system was completed with a Nagra Classic preamp ($17,000), two Nagra monoblocks ($16,000 each), Avalon Indra loudspeakers ($34,995) and Kubala-Sosna cabling. Room treatment was accomplished with Acustica Applicata DaaDs (Diffusion Absorption Acoustic Devices). Especially memorable was L’histoire du soldat, played back from a Reference Recordings LP and several original DSD recordings made by master engineer René Laflamme, who was in attendance. I’d be justifiably tarred and feathered if I were to characterize the gear listed here as “inexpensive”—but in comparison to the no-holds-barred stuff, it really does represent good value. 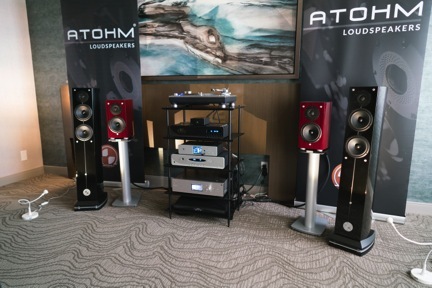 In Room 1019, an Atoll Electronique CD200se2 digital front end ($2800) fed that same manufacturer’s IN200SE integrated amplifier ($2500) which drove two speakers from the French company Atohm, either the GT HD1 bookshelf model ($4495) or the GT2 floorstander ($7495). Cables were Transparent Plus (interconnect $400/meter; speaker cable ($1100 for a 12-ft. pair). Both speaker options played “big,” with a great sense of dynamic headroom. The sound was open, spacious, and uncolored. MQA is no longer at the cheerleader stage; it’s really happening. Warner is on board with the other two “majors” expected to follow shortly, and many smaller independent labels have signed up as well. Processors that were MQA-compatible, ranging from the affordable (NAD) to the astronomically priced (MSB), were playing MQA encoded files. Best of all, A/B comparisons were running steadily throughout the show, demonstrating to most (me included) that the improvement to both HD and standard resolution recordings is substantial.